Being that this is the first post on the site, I figure that we should start with a classic. 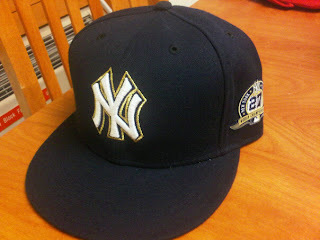 The good old New York Yankees interlocking N Y fitted. As most of us know, the New York Yankees are one of the most prestigious teams in all of sports let alone baseball. They have 16 Eastern Division Championships, 40 American League Championships and most importantly to this point an unprecedented 27 World Championship titles. I've been to hundreds of Yankee games growing up in the tri-state area, and this particular cap I picked up at spring training this year. This fitted, which has had multiple representations in my collection, has been a part of my addiction since day one at some point in 2001. It is globally recognized as the most famous symbol in all of sports. This is one of my favorites, and always will be because it represents pride and greatness. Navy blue crown and brim, and a vibrantly white interlocking N Y outlined in gold to celebrate the afore mentioned 27th world championship. Featured on the left side of the cap is a commemorative champions patch with the number 27 in it. Simple, yet refined.